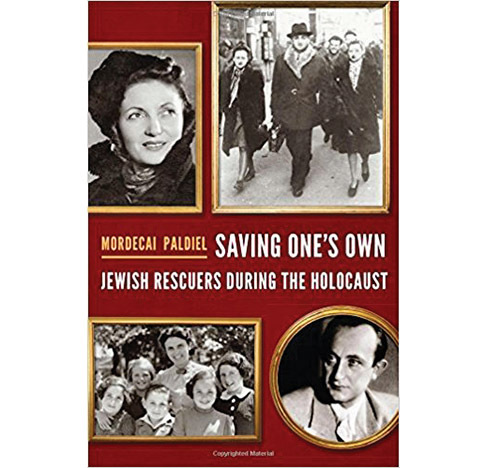 Reviewing: “Saving One’s Own: Jewish Rescuers During the Holocaust,” by Mordecai Paldiel. The Jewish Publication Society. Hardcover. 636 pages. 2017. ISBN-10: 0827612613. Dr. Mordecai Paldiel dedicated over two decades of his life seeking out the righteous among the nations, the gentile men and women who risked their lives to save Jews during the Holocaust. Throughout this journey, Paldiel came across numerous stories of other heroes, courageous Jewish heroes, who put themselves in a danger even graver to save their fellow Jews from death. As a beneficiary of the efforts of a Righteous Gentile himself, as he was saved by a French Catholic priest as a child, Paldiel felt a need to give back and worked for Yad Vashem, The World Holocaust Remembrance Center in Jerusalem, for 24 years. As director of the Department of Righteous Among the Nations, Paldiel’s job was to identify and honor non-Jews who risked their lives to save Jews—he added 18,000 names to the registry. Under the Yad Vashem program, a gentile saving one Jew is a sufficient criterion for recognition, but in this case Paldiel was seeking to honor those who had created elaborate plans and clandestine networks in efforts to save their fellow Jews. Paldiel’s goal was complicated by the fact that this concept wasn’t in the original mandate of Yad Vashem. The law that created Yad Vashem, legislated by the Knesset in 1953, only stated that the organization would be obligated to honor the gentiles. In 2007, with the debate still ongoing, Paldiel retired from his post at Yad Vashem and moved to the United States to join his children. Four years ago Paldiel decided the time had come to tell the stories of these unsung Jewish heroes, and he began work on his ninth book. Paldiel’s book includes remarkable stories of remarkable people. One exceptional example is that of the Bielski brothers, the Polish Jews who established a large partisan camp in the forests of Belarus (depicted in the 2008 major motion picture “Defiance”). The Bielski brothers, led by Tuvia, accepted any Jewish person no matter how old or weak. Tuvia Bielski succeeded in saving over 1,200 Jews from the Nazis, in one of the largest rescue operations of Jews by Jews. Rabbi Zalman Schneerson bravely established homes for adults and children in need in France during the war. He eventually went into hiding, moving the children from chateau to chateau to stay ahead of the Germans. Ultimately, when many of the children were taken to Auschwitz, the rabbi remained with the surviving children until France’s liberation. Paldiel discovered that he was one of the children who had been hidden in Rabbi Schneerson’s home in Marseilles for some time. Rabbi Michael Dov-Ber Weissmandl from Slovakia crafted the Europa Plan, a bold and elaborate ploy to “negotiate” with the Nazis. Taking advantage of the Nazi propaganda that the Jews had actually launched the war to destroy Germany, Weissmandl fabricated documents claiming that he was a delegate sent to negotiate a deal. These documents eventually made it to S.S. Commander Heinrich Himmler and, to Weissmandl’s shock, Himmler was willing to negotiate. Himmler told Weissmandl that for two million dollars they could halt the Holocaust in France and Belgium—with $200,000 up front. Weissmandl scrambled to raise funds, reaching out to Jewish organizations, but was met with skepticism and resistance. After repeated failed attempts, Weissmandl eventually aborted the mission. Weissmandl was, however, credited with bribing the Slovaks for a period of time, saving thousands of Jews from death. Paldiel tells of Marianne Cohn, a Jewish woman born in Germany who fled to France. When the Germans came into France, Cohn joined the Jewish underground smuggling Jewish children across the border into Switzerland. Cohn went on several trips until she was arrested in May 1944. She remained in prison until the evening of the German retreat when she was taken into the forest and brutally killed at age 22, tortured before her death for refusing to give information. Two Frenchman along on that last trip were arrested but released. These Frenchmen were later honored as Righteous Gentiles, yet Cohn—successful in saving over 200 children—received nothing. “Why isn’t there a street in Israel named after her?” Paldiel asked. Born Marcus Wajsfeld in Belgium in 1937, Paldiel and his family fled to France when the Germans came, and later crossed into Switzerland with the help of the French cleric. The family came to America in 1950, where Paldiel attended a Lubavitch yeshiva and served in the U.S. Army. Paldiel made aliyah in 1962, serving in the Israeli Army and studying at Hebrew University. There he met his wife Rachel and had three children, later returning to the States, where he received his M.A. and Ph.D. in Holocaust Studies from Temple University. Paldiel returned to Israel in 1982, and shortly thereafter discovered that Yad Vashem was seeking employees. With his extensive background and education in Holocaust studies, he was a perfect fit, and was hired. One of the most meaningful encounters for Paldiel occurred when a French monk visiting Yad Vashem stopped into the office. Paldiel asked if he would help find the cleric who had saved his family. The monk left with the relevant information, and a few weeks later Paldiel received a postcard from the priest himself. “I almost fell off my chair,” recalled Paldiel. On September 19, 1989, Yad Vashem recognized Simon Gallay, the French Catholic cleric who had saved Paldiel’s family 46 years earlier. Paldiel visited Gallay in France to award him the prestigious Righteous Among the Nations medal and a certificate of honor. Today, Paldiel lectures widely and gave the keynote address at the U.N. Holocaust Memorial Ceremony in 2013. He teaches courses on the Holocaust and on the History of Zionism at Yeshiva University and Touro College.